pie in the sky: Thank You! Just a brief, heartfelt extension of gratitude to my beloved J, who made me sit on the sofa and read a book (Hungry Planet, what else?) while he prepared the luxurious dinner featured above: a fabulous stir-fry featuring giant prawns, ramps(! 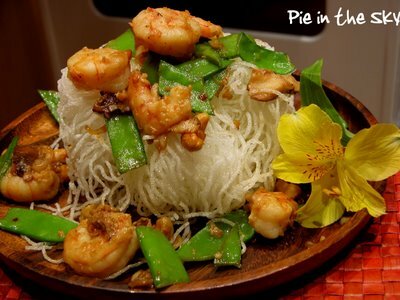 ), snow peas, cashews, shitake mushrooms and garlic...all atop a gorgeously crispy nest of fried vermicelli (which was by far the most exciting thing to ever happen in my kitchen - the noodles magically quadrupled in size when they hit the hot oil!). Dessert was a yummy bowl of gourmet green tea ice cream and vanilla cream cookies. I finished everything...including my book! That looks exceptionally tasty! When I get back I would sincerely appreciate a cooking lesson for that dish...please? Hungry Panet was great!It's got a portrait of about fifty families from all over the world - from the US to Chad to Paris to Mongolia to Greenland - with everything they eat in a week. It gives history about each family and relevant statistics about the places they live...not only a beautiful photographic journey, but a very potent commentary about food politics and American overconsumption. I highly recommend it!